The Physics Groupie Blog: Exactly What Happened at LHC? The LHC control center was slowly raising the current in the magnets in the LHC region called sector 3-4. This is where the failure occurred. Monitor screens lit up with alarms that more than 100 magnets had "quenched" which means they lost their superconductivity. It was known that uncontrolled quenches like this could be disastrous, so it was immediately realized that something serious had happened. It turns out that the magnet quenching was by design. LHC automatically brought the magnets out of their superconducting state to protect them. Investigation showed that a single "busbar" connection on one of the magnets was improperly attached. Each dipole magnet is 15 meters long with a .5 meter diameter. The busbar is a small ribbon of niobium-titanium alloy, about as wide as a finger. The busbar supplies current to the magnet. The bad braze of the busbar came undone when 8,700 amps of current vaporized a .5 meter length of the ribbon. This punctured the LHC's heavy vacuum insulation. The liquid helium the insulation protected boiled immediately. The outer shell gave the gas boiling off nowhere to go and in places the pressure built up to 20 atmospheres. A leak formed with helium escaping into the tunnel. This pried magnets loose of their steel anchors and all told, 53 magnets were affected. Not only do the magnets have to be replaced, but relief valves need to be designed throughout LHC to prevent busbar bursts. 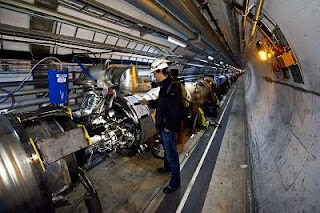 LHC is located at CERN (the European Center for Nuclear Research) on the Swiss – French border. LHC is a circular particle accelerator that is 17 miles in circumference, and will accelerate protons to 7 trillion electron volts. LHC is interesting because it could make important discoveries in a number of areas, one to solve the mystery of the origin of mass. Theory predicts the existence of a Higgs boson (the long time Holy Grail of particle physics), which gives mass to other particles. The LHC has been designed to cover the mass range where the Higgs is predicted to be. So if the Higgs exists, the LHC will find it. Other questions the LHC could potentially answer include the origin of the matter/antimatter asymmetry and the nature of dark matter and dark energy. It may also pick up evidence of super symmetry or extra dimensions. Plus, LHC could find many things nobody has even considered yet. LHC is a discovery machine. Of course there are the sensational stories in the mainstream press reporting that LHC could open up micro black holes and eventually swallow the Earth. Imagine that, death by black hole!